A huge part of the Boston Celtics' success in the 1980s, Kevin McHale is a Hall of Fame big man and one of the top players in NBA history. McHale has also maintained his relevance in the basketball world as the current head coach for the Houston Rockets. While his values will never approach that of his teammate, Larry Bird, there is still good interest in Kevin McHale cards. 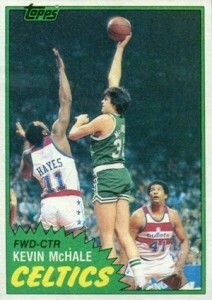 Shop for Kevin McHale Cards on eBay. Following a stellar career at the University of Minnesota, the Boston Celtics selected Kevin McHale with the third overall pick in the 1980 NBA Draft after trading down from the first pick. The deal with the Golden State Warriors netted them Robert Parrish in addition to the pick used to select McHale. The duo would join Larry Bird to form one of the greatest front lines of all-time. Noted for his dominant play, agility around the basket and overall physicality, Kevin McHale won three NBA titles with the Celtics and also had seven All-Star selections. Twice named the Sixth Man of the Year, McHale was also a force on defense with three All-Defensive First Team and three All-Defensive Second Team nods. After his retirement following the 1992-93 season, Kevin McHale was inducted into the Hall of Fame and his number (#32) was retired by the Celtics. Since then, Kevin McHale has stayed involved in the sport as a head coach. After a few seasons with the Minnesota Timberwolves, he was named the head coach of the Houston Rockets in 2011 and has continued the franchise's winning ways. Starting with his rookie in 1981-82 Topps, collectors have several cards for Kevin McHale from the 1980s. Just as the basketball product options started picking up in the early 1990s, McHale retired. Still, there is a good mix from his playing days and many more cards since then. The earliest relic card for Kevin McHale was released in 2001-02 Upper Deck Legends and the first McHale autograph card was not available until 2004-05 Skybox Premium. He has signed more in recent years, especially for Panini products. The first Kevin McHale NBA card and his official rookie, 1981-82 Topps was an odd farewell release from Topps, who would not make another basketball product until 1992-93. While the main 66-card set was available in all regions, specific subsets were issued in the East, Midwest and West. McHale was part of the East release, and his card numbering reflects that. 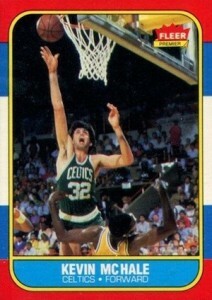 As far as HOF rookie cards from the 1980s, McHale's is largely unappreciated. The only brand available to NBA collectors until 1986-87 Fleer, Star picked up the void left by Topps, but in a minimal fashion. Kevin McHale's first star card is simple and features a bright border that is sure to appeal to a fan of the Celtics. The entire run is limited, but the McHale card is among a group of short prints. Another notable option for Kevin McHale, 1986-87 Fleer is all about the rookies, but there are plenty of Hall of Fame vets, like McHale, that go for very inexpensive amounts. Shown bulldozing through the paint, this card can be found ungraded for just a few dollars. 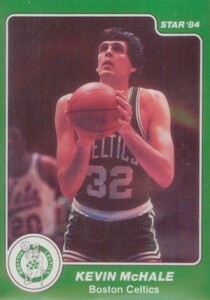 1991-92 Hoops #255 Kevin McHale AS Team: Boston Celtics All-Star! 2008 DONRUSS SPORTS LEGENDS AUTO KEVIN MCHALE #25 AUTO 47 369 Free Ship!